Tokyo Institute of Technology, in collaboration of Mongolia National University of Education (MNUE), Ministry of Education Culture, Science, and Sports (MECSS) and JICA, organized the National Teacher Training on 10th to 14th of September, 2018 as a part of JICA grassroots project “Sustainable use of ICT for improving the quality of lower secondary education in rural Mongolia through development of STEM teacher training materials”. Yamaguchi-Takada laboratory members, Prof. Yamaguchi, Shengru Li (D3), Yuji Hirai(D3), Yiqiong Mai (M1) participated in the training. 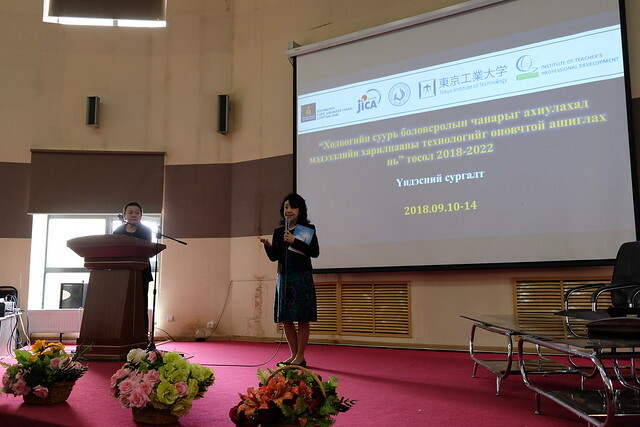 A total of 124 methodologists from 21 aimags and 9 districts in UB city gathered and received training. 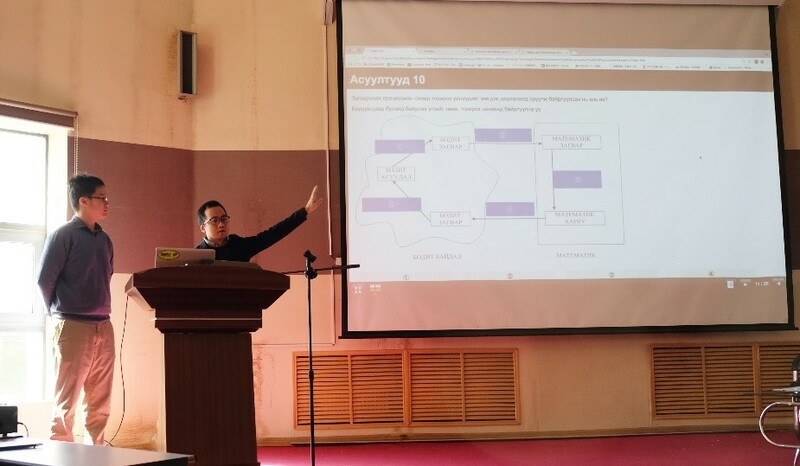 The aim of the training is to improve methodologists’ knowledge and skills to conduct teacher training using ICT for teachers at each aimag and district. On the first day, there are general lectures about trend of ICT integration in education and digital teaching material creation. From the second day, subject specific sessions for Chemistry, Biology, Physics, Design and Technology, History, Geography, Mathematics and Informatics were conducted. At the beginning of the five-day training, Mr. Surenchimeg, the Director from Institute for Teachers Professional Development (ITPD), Prof. Yamaguchi from Tokyo Tech, Mr. Tsolmon from MECSS, and Dr. Bat-Erdene from Project Steering Committee gave speech at the opening session. Mr. Surenchimeg encouraged methodologists to gain knowledge and skills as well as bring that to their own aimags. Prof. Yamaguchi explained the history of collaboration with Mongolian education sector and expressed appreciation to lower secondary school teachers who actually initiated the idea of teacher training using ICT 12 years ago. Mr. Tsolmon emphasized the teachers’ collaboration to achieve the goals of the project. Dr. Bat-Erdene also expressed importance of teacher collaboration as one of the essential factors for successful project implementation. There are six sessions for the first day of the training. The first session was conducted by Prof. Sukhbaatar. He explained evaluation of JICA grassroots project phase 1, “Sustainable use of ICT for improving the quality of primary education in Mongolia” implemented for primary education in Mongolia from 2012 to 2017. The second session was conducted by Ms. Oyuntungalag, the Deputy Director from ITPD. She shared current trend of ICT use for teacher development especially about eight teacher portal website provided by ITPD. The third session was lecture by Turmandakh, the Director, “Munkhtenger” studio about creating documentary films for teacher development materials. The fourth session is lecture by Prof. Tsedevsuren from MNUE. He talked about important skills for teachers in digital era. The fifth session was lecture by Dr. Amartuvshin from MNUE about method to create digital training material. The last session of the day was practical session for using Camtasia program for video recording and editing. Prof. Tsedevsuren facilitated the session. Subject specific lectures and practical sessions were carried out by 15 professional team members from Mathematics, Chemistry, Physics, Biology, Design and Technology, Informatics from the second day to the fifth day of the training. Methodologists were trained to be able to use new ICT software and apply it effectively to student-centered teaching method. On the third day, Li and Hirai from Tokyo Tech team presented and demonstrated interactive materials for Mathematics, Chemistry, History and Social Science, and Design and Technology subjects for lower secondary school teachers. Showing the questions on the screen, Ms.Orgilmaa explained the questions and interacted with methodologists. Methodologists showed their interest in the materials and answered the questions. The five-day national training with 124 methodologies from nationwide was successfully completed on 15th of September. All participants are going back to their aimags and conduct aimag level training. Knowledge and skills introduced in the national training will be localized and delivered to local teachers in the whole country. It was also a great experience for Tokyo Tech team to attend the national training. Individual impressions are written below. 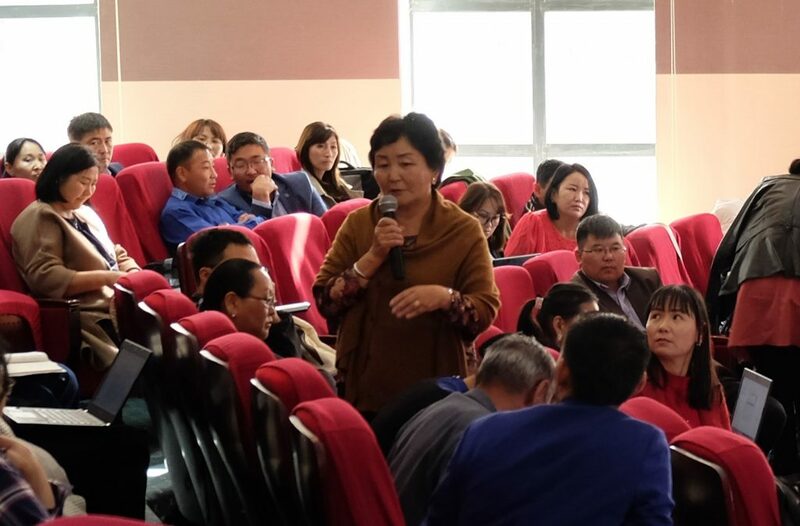 Shengru Li: I was more than excited to attend the national level training for 124 lower secondary school methodologists from all 21 aimags and 9 UB districts of Mongolia. This five day intensive and informative training is unique that each subject professor presented the student-centered pedagogies and the use of ICT to promote student-centered lessons using various tools. During the training, methodologists also practiced the use of video editing tools to create videos. It will be very interesting to see the locally suitable digitized teacher training materials produced by local lower secondary school teachers, incorporating various ICT tools and student-centered pedagogies. I wish all the success to the project implementation, and very fruitful outcomes in the future. Yuji Hirai: I appreciate the opportunity to participate in the national training in which 124 methodologists gathered and received training to develop education in Mongolia. Although there is huge potential of ICT to enhance education, I was impressed by professors’ and methodologists’ comments that objective in education is the most important thing and ICT is just an tool to achieve this objective. They mentioned that it is essential to choose right technology, use it right way and integrate it into traditional teaching method. I am interested in how teachers will localize the use of technology and adopt their daily educational activities. Yiqiong Mai: The national training was very impressive for me. As a student who graduated from the IT major, all the teachers and students around me talked about ICT during her undergraduate. However, it was my first time to see so many people gather and talk about ICT for education. It was very impressive for me that methodologists show their great interests in ICT and keep exploring the better ICT tools and skills for education. So many innovative and useful software and programs were introduced during the training. The methodologists not only introduced the programs, but also explained how to localize the programs and make better use of the programs for the local education and for different subjects. Methodologists were able to get access to new ICT tools as well as improve their teaching methodologies. I want to express my best wishes to the project. And I am willing to work with methodologists and teachers to achieve the success of the project. ← Happy Birthday, Professor Yamaguchi!